Description: Herb 18–45 cm high; branches hairy with glandular and non-glandular hairs, sessile glands also present. 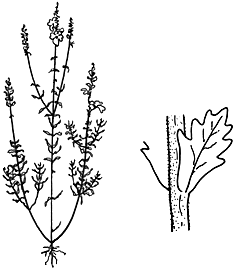 Main inflorescence-bearing axes bearing branches or young shoots (sometimes very small) near or well above ground level. Uppermost leaves of main axes usually 3.4–7 mm wide, usually with 1–3 pairs of teeth; leaves 7.5–13.5 mm long. Outer surface of calyx glabrous or hairy. Corolla 9.5–13.5 mm long, white; lower corolla lobes usually obtuse to truncate, sometimes shallowly emarginate, rarely emarginate. Distribution and occurrence: Usually grows in snowgum woodland and surrounding grassland in the montane and subalpine areas, also heathy areas on sandy and clay soils in coastal regions; south from Torrington and Port Macquarie districts, also recorded from the Moree area and eastern Warrumbungle Ra.